This futuristic Smart For Two lookalike is in fact the Gordon Murray Design Motiv – and no, the latter part of that name isn’t a typo. 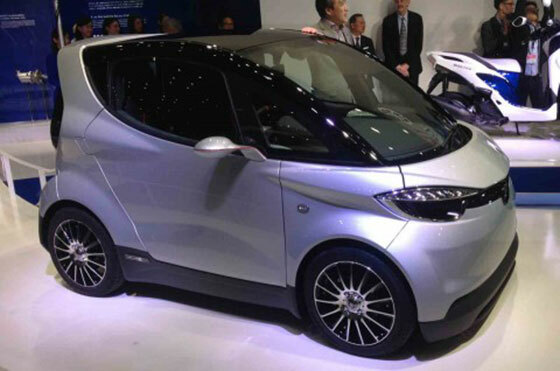 Built in conjunction with Yamaha, the Motiv uses elements of F1, motorcycle and extra-automotive technology to try and cut down on the environmental impact building – and running – a car creates. What’s so revolutionary about the Gordon Murray Motiv? Mainly, it’s the two-seater’s production process, coined ‘iStream’ by the 240mph McLaren F1’s designer Gordon Murray. In development for 15 years, the idea could cut the size of a regular car production plant by up to 80%, according to manufacturer predictions. In principle, iStream dispenses with the production line assembly of cars used since Henry Ford’s Model T, instead building cars in a more methodical pre-packaged style. Wiring looms and control units are fixed to pre-painted panels, which are then bonded together in an F1-like sandwich structure, reducing weight but actually enhancing stiffness and safety. It’s also faster than welding together cars with robots, as per the template of mass-production in 2013, and creates less waste material. It’s car not just a basic shopping trolley though. The Motiv’s all-independent suspension and electric powertrain are claimed to give ‘new levels of ride and handling’ performance, as well as suiting the car’s need to be nippy and eco-friendly, given its urban brief. What’s the spec of the Motiv? In electric guise, the rear-drive Motiv develops a peak of 34bhp, and a huge 660lb ft – continuous torque is 485lb ft. The 730kg Motiv hits 62mph in around 15sec, and tops out at over 65mph. The real-world range is claimed to be 100 miles. What’s Yamaha’s role in all this? The Japanese outfit is the first engineering firm to take the plunge with Murray’s iStream concept and attempt to implement it into a full-scale production reality. Yamaha has yet to sign off on the cost-effectiveness of rewriting the car design and production rule-book, but if the Motiv gets the green light, electric and conventional petrol-powered versions could be hitting a city street near you as early as 2016. It’s likely to be priced at around £10,000 to compete with Smart’s new For Two and the new rear-drive Renault Twingo. This entry was posted in News on February 26, 2014 by alistair.